My hands are covering my face as I stand outside Santiago de Compostela Cathedral in shock. Tears dropping into my palms. “I’m still down here, what do you say?” .These were the words from my best friend on bended knee in the main square. “Yes, yes, yes. Of course yes” I manage to whisper struggling to pull myself together. I pride myself on my ability to predict future occurrences but in this moment I was completely caught off guard. We were finishing our journey on the second section of the Portuguese Coastal Way alongside groups of delighted walkers. Little did I know this was going to be the start of another epic journey. The setting couldn’t have been more perfect. Santiago is an extra special town that radiates with positivity. 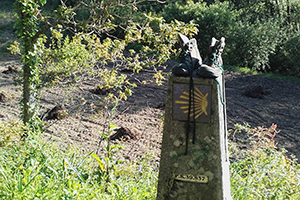 As the finishing point of the Camino de Santiago every person you meet is bursting with enthusiasm for life. If there was ever a time and place to propose this was it and he did it. 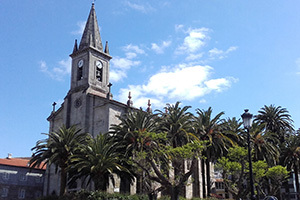 When we arrived in the seaside town of Baiona our excitement masked any tiredness from travelling. After quickly freshening up we head out to explore the sunny coastal village. Lucky for us this town is packed with tasty seafood and amazing sea views. 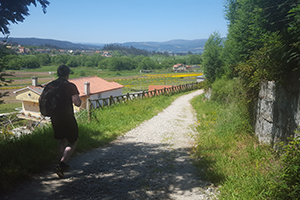 This first day of our Camino trip set the tone for the week. We decided to use our time to relax, reflect and enjoy every minute. I had been keeping a close eye on the weather before our trip and we were a little worried as the forecast was for grey skies and rain but as soon as we arrived in Baiona the sun came out to greet us. It was time for the beach. Spending a few hours strolling along the harbour we decided to walk around the fortress walls. With little beaches dotted all around the wall it would have been sinful not to have a dip so we dived into the cold Atlantic. Start as we mean to go on was our attitude. In the evening I was in a rush to try out the famous Pulpo of Galicia in the closest restaurant. Pulpo looks similar to fried chicken and it is commonly sprinkled with paprika. I don’t know if we got a bad batch but it wasn’t for our taste and we quickly moved on to some cerveza and pinchos. A cold beer with some tapas was the perfect way to end our first day. Bright and early on our first day of walking we set off to Vigo. We followed a winding road out of Baiona that gave us spectacular views of the coast. This is a long day of walking so be sure to stock up on plenty of snacks and water but the views are worth every step. Keep a close eye out for the beautiful wild flowers along this section. If you don’t see them you are sure to smell them. The smell of the sea, mixed with vineyards, wild flowers and orchards of lemons is one of the most memorable features of the whole journey. We arrive in the metropolitan coastal city of Vigo in the late afternoon. I am too excited to have a rest so I grab my camera and take a stroll to the harbour. We found a cosy bar and finished our day with a few well deserved beers. From Vigo we meander narrow roads towards Redondela, sore feet and blisters signalling our tired bodies. The short walks through tiny villages seeming longer and the longer trails through forests seeming to go on forever but every corner has its beauty and it isn’t long until we stumble upon a wonderful taperia called Vila Rosa which overlooks the coast. 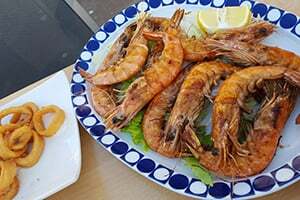 Once we had filled our gurgling stomachs with croquetas de Jamon and fresh calamari, we looked forward to a good nights sleep. On day 4 we ordered two cafe con leche (with milk) and two gigantic croissants to fill us up for the morning trails. We remarked on how people took their time at breakfast, locals setting themselves up on bar-stools for the day ahead. The slow pace of life that you find in all of the towns along the way is enchanting. 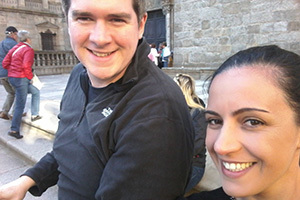 We reluctantly made our way out of the old plazas of Pontevedra getting closer to the finish line. Little did I know that Erc had been nervously guarding the ring in his wallet all along the way. Caldas de Reis was one of my favourite places along the route. Speckled with sunshine on every corner, this charming village was bursting with life and we got the chance to speak with lots of fellow walkers. We spent an evening eating spicy chorizo, planning our next big adventure and laughing at our failed attempts to communicate with non-english speakers. Learning Spanish is definitely a future goal. By the time we had reached Padron we were exhausted. Looking back on it now on our final day Erc was a little giddy. He was more eager than usual to get to our finishing point. He had a huge smile across his face every-time that I looked in his direction. “Wow, this is great. I had no idea that he would enjoy the walk this much” I thought to myself. I had no notion of what was coming. Could there be a magical ending to such an amazing week of adventures? Yes, yes, yes. 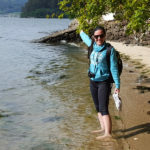 We spent a week walking from the stunning city of Baiona to the historical gem of Santiago. 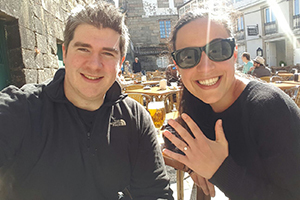 On our final day outside the Cathedral in Santiago my boyfriend proposed and we are looking forward to a future full of love, happiness and adventures. 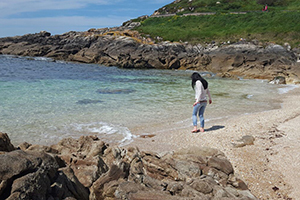 For more information on the Portuguese Coastal Way you can contact one of our Travel Specialists. Hi Camilla, thanks so much for your heartfelt wishes. It was the most perfect moment just like you described. We are looking forward to many more adventures ahead. Kindest regards, Lisa. Congratulations, my now husband proposed to me just over two years ago in the square in front of the Cathedral after a week of walking. I could not have dreamed of a better place for it to happen. It was the perfect end to the week although walking the camino was fantastic in itself. It was still talked about at our wedding last year. Best of luck in your future life together. I hope this is the first of many wonderful memories for you both.